... of Madrid, and into the fire of Andalusia! I've been visiting Spain regularly for about 15 years now. For the first few years I refused to go there in summer for fear of the terrible heat, always preferring spring or autumn. Apart from the question of survival, the other advantage of going off-season is that there are fewer (other) tourists. And when I had a real job I had the luxury of choosing the dates of my holidays. My circumstances have changed, however, and in recent years I've had to take my holidays at restricted times, the summer months being the only time I can take more than a week off. The result is that I now know it's possible to visit Spain in July or August and survive! But what about the South, Andalusia? Everyone says the best time to visit Seville, Cordoba and Granada is spring or autumn. Well, I can't do that, so I've concluded that if I ever want to see these mythical places I'll have to do it in summer. But for my first voyage into the inferno I'm taking it easy — just four days out of my three-week trip. I'm travelling from Paris to Madrid by overnight train, which I find a very civilised way to get from one city centre to another. I'll board the train at Gare d'Austerlitz at 7 o'clock in the evening and take my place in a four-seat air-conditioned compartment where I'll meet the three other passengers I'll be sharing my space with on the journey. I'll try and size them up to see who'd be an interesting travel companion, who's more likely to be a bore. (I'm still friendly with an American guy I met on this train a few years ago who fortunately fell into the former category — I suppose the fact that he was offering to share a bottle of reasonably decent Spanish wine was a good start). Then I'll read a bit over a beer or a glass of wine before dinner in the surprisingly good restaurant car. A glass of brandy or two will round off the evening and I'll go to bed in the now-transformed four-bunk compartment. 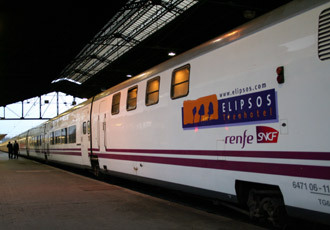 The guard will wake us in time for breakfast at 8 o'clock and we'll arrive at Estación de Chamartín in the middle of Madrid at 9. I have two good friends in Madrid who are very kindly providing me with two different places to use as my base for my holiday in Spain. Apart from the aforementioned Andalisian adventure, I'm going to Puente del Congosto and Salamanca for a few days. I plan to make other brief excursions out of Madrid, but I have no fixed arrangements yet.